Let me start by saying that I love small businesses and like to support them whenever I get a chance. 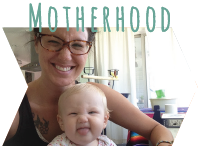 Mamas helping mamas is my absolute favorite and this is a company you definitely want to give your hard-earned money to. Susan Peterson, who runs Freshly Picked, has two kids and, with her team, makes each pair of moccasins by hand out of her home in Utah. She is constantly working on improving her products and making sure they are "durable, well-designed" and stay on our little's feet; and I love that she is a mom and used her son as a tester. 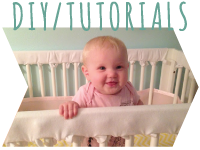 She even has a video on her blog where she encourages entreprenuers to follow their dreams and conveys how she balances her life as a mother and a business owner. 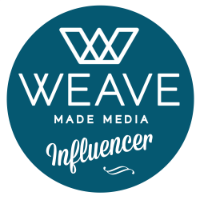 Knowing a bit of her story makes me love this company even more, and makes me want to support other companies like this. Helping and supporting each other, as mothers, is what it is all about. I received an email that my moccasins were being shipped and I was so excited! They came a few days later in a soft envelope, inside a cute little bag with the Freshly Picked logo on it. I wish I would have snapped a pic but was too excited and just ripped it open! They are really well made soft-soled shoes and have to be, these kiddos really put some wear on their first walking/standing shoes. We've had them for a month and none of the stitching has come apart or suede has worn down, their construction is super solid. 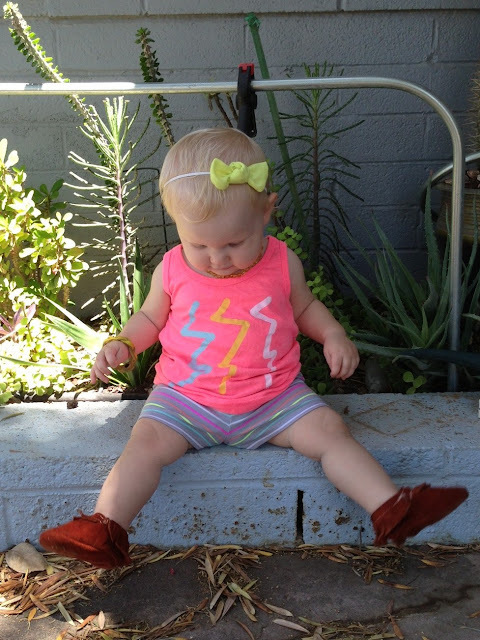 I also like that they are different pieces stitched together so that when your little one steps or stands, there is a pocket that forms on the side that is actually open to the back of the shoe, allowing for air to flow and great for an Arizona summer. I also like that after she wears them for a bit the fringe curls up, making them even cuter! We have always had trouble putting Lemon in shoes because her feet are so small and chubby on top and she curls her toes. Nothing seemed to fit her well and nothing would stay on, until we got these. 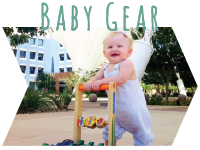 The elastic makes them snug but also allows for easy on and off (great for when you're dealing with a very wiggly 10 month old), and if you get a little bigger size they are roomy and seem pretty comfortable. 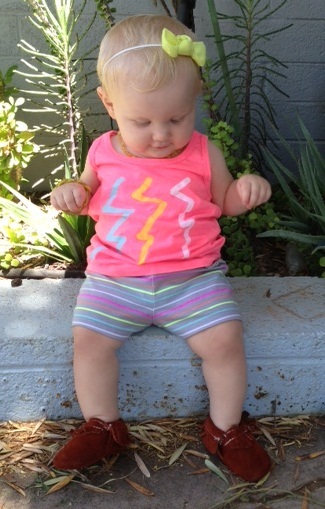 They don't seem to bother her like other shoes do and they haven't fallen off her feet yet. They are also really easy to crawl and move in. Our little muffin isn't quite walking but is standing and crawls everywhere, and these moccasins don't seem to make it hard for her. We also have hardwood floors and laminate throughout our house and she doesn't slip in them, even though the bottom is suede and there is no tread. Babies on slippery floors definitely have to have traction to learn to stand and plop down, and these are almost as good as bare feet, she hasn't taken any tumbles yet while wearing them. These moccasins go with everything and that's why I picked this brown color - I am even totally a fan of babies in moccasins and dresses - is there anything cuter?! 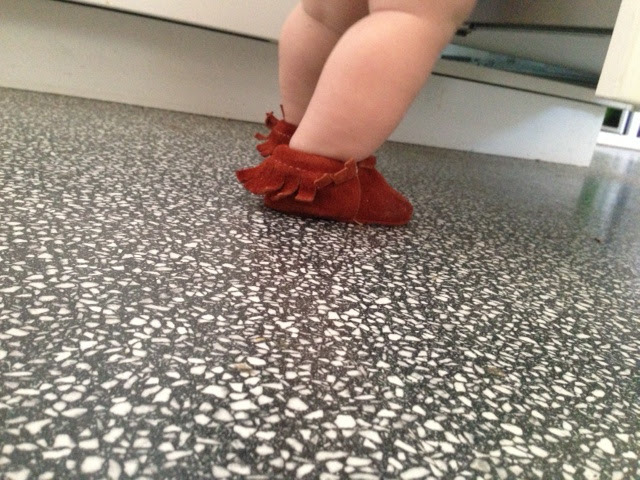 They embrace her native spirit (her daddy, after all, is half Native American) and I think she just looks so darn cute in them. Lemon has two pairs of Minnetonka moccasins but we can't seem to get them on her without them slipping off the minute she moves, the velcro across the top totally doesn't cut it. 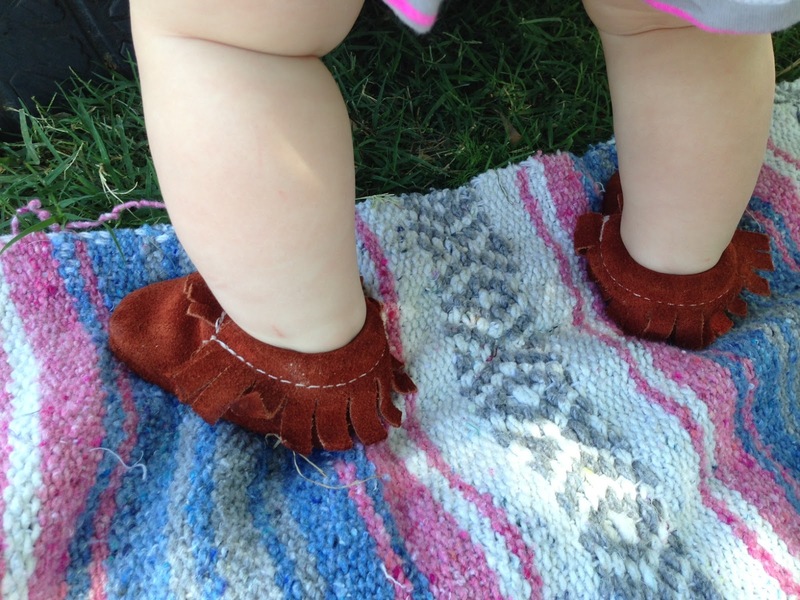 I would choose Freshly Picked moccasins over Minnetonkas any day, even at a more expensive price - you are paying for a well made shoe that stays on your baby's foot. 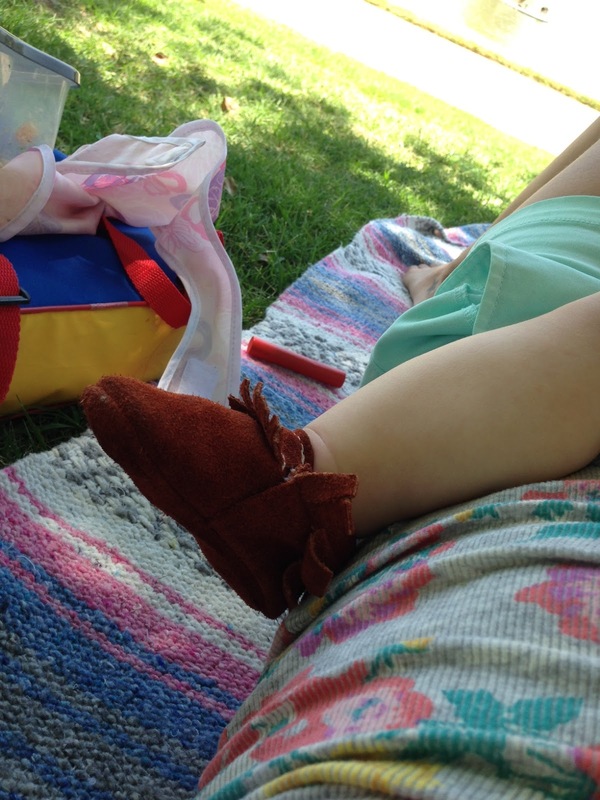 Even though we love these moccasins, there are a few things I wish were a bit better. These are soft-soled shoes and do not come with tread on the bottom. 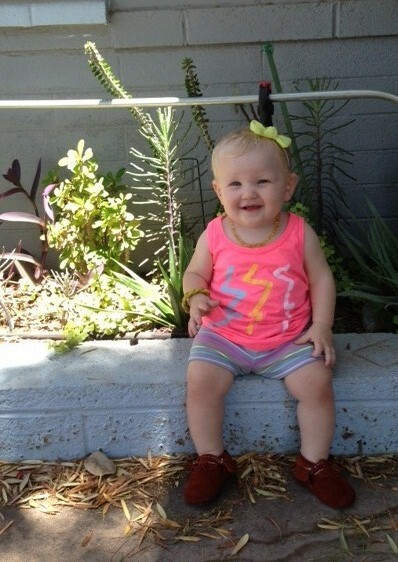 For that reason, I can only imagine our babe wearing them for the next year or so before she needs to wear actual shoes out and about. I have seen 2-4 year olds in these shoes but wonder if they are really functional as out of the house, every day shoes. But, like I said before; for soft-soled shoes, these are the best we've found so far. It is difficult to know which shoe goes on which foot - something that is tough to figure out while you are holding down your always on the go babe. You really have to look at them to see where the slight curve is that tells you which one goes where. I think that next time I will opt for a leather pair instead of the suede. Even though I like the look of the suede and think it may be cooler in the summer, the suede gets dirty easily. This may not be an issue for others but I feel that if I spend $60 on a pair of baby/toddler/kid shoes I don't want to constantly be dabbing at them or taking them off in fear of them getting dirty. 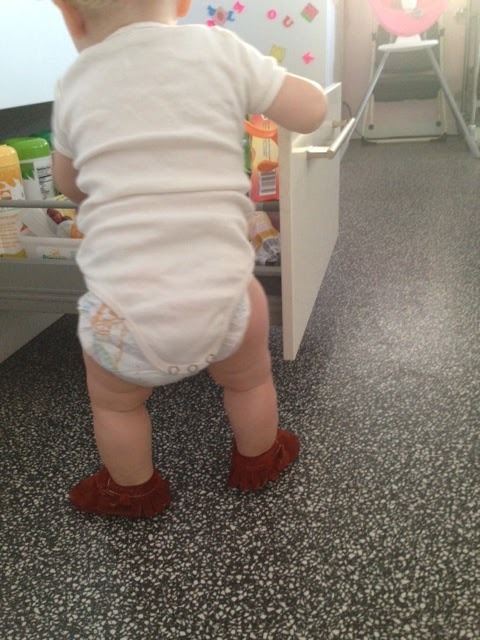 You also have to have clean floors, if you opt for the suede, because they act like little microfiber cloths when she crawls or walks along things, catching all of the dust and dirt. And, the question on everyone's mind: Are they worth the price? My husband and I are pretty frugal when it comes to clothes/accessories and we hardly ever buy name brand items. I mostly shop at American Eagle (always has sales) and thrift stores because I love a good deal. 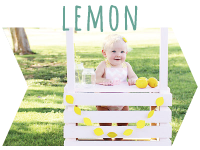 I do buy Lemon new clothes from Carter's, Gymboree or Old Navy (as well as some thrift store finds), but I haven't splurged on anything for her except a couple of popular name brand, used items, from some Instagram shops (have you done this? It's awesome!). However, I think that owning a pair of Freshly Picked moccasins is like owning a KitchenAid mixer, a sort of rite of passage (is that weird?). 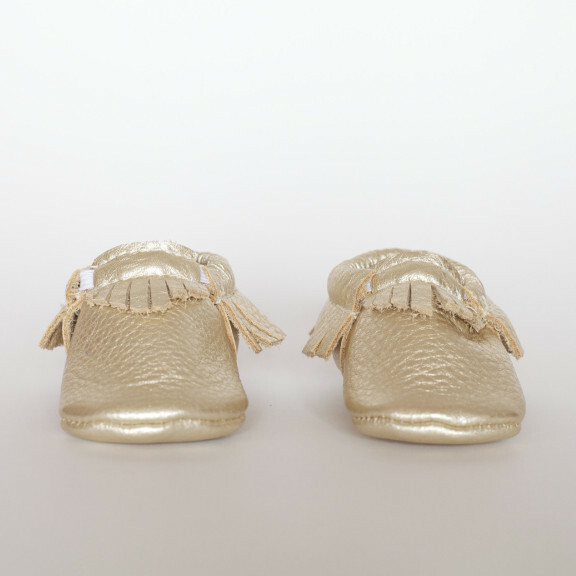 I think they are absolutely well made and super cute and for those reasons alone I think that every baby/kid should definitely own a pair. But, the logical and frugal side of me says that these are still baby/kid shoes so they are definitely going to get dirty (or lost) and I'm not sure how they would hold up in the wash. But, if you don't have another muffin to hand them down to, they do have a good resale value on IG so that is definitely an option. So, if you are like me and can just let that part go, the part about them being for someone that will grow out of them quickly, get them dirty and will probably need a couple of other pairs in their lifetime - then they are definitely worth the price. I like how they fit, how they look and that they are easy for Lemon to move around in so that makes them worth it to me. They are the best shoes she's had so far and I could see us getting them for her again as soon as she outgrows this pair. 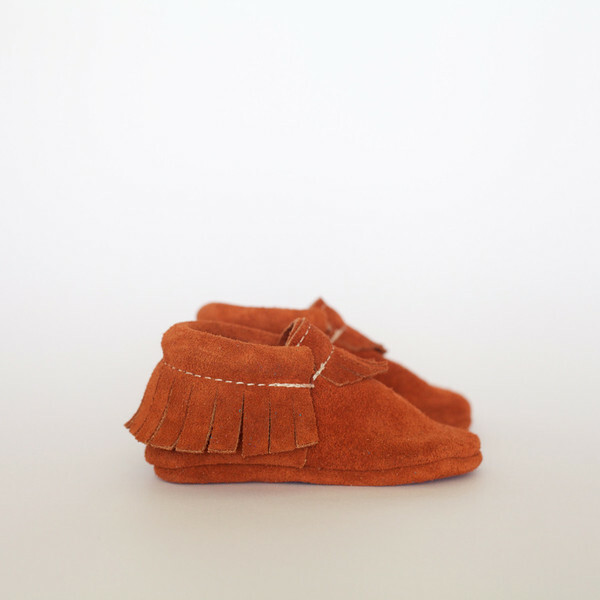 To order your little one his/her own pair of Freshly Picked moccasins, click here. You wont be disappointed! Please note: I received a free product to review, but the opinions expressed above are 100% my own. Awesome review!! We are huge lovers of freshly picked here. My son is 2 and loves them. 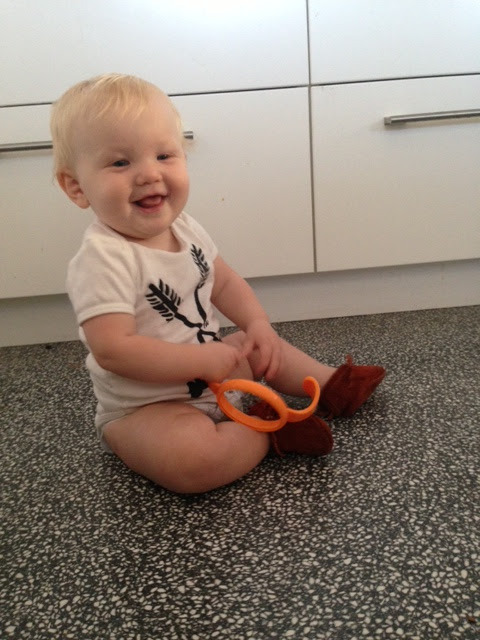 He really doesn't like wearing shoes except these are the only ones he never complains about!! You have performed a formidable job and our whole community shall be thankful to you. Thanks for this review - I'm on the fence! Even with the sale, it's a lot for a pair of baby shoes! I appreciate that you live in AZ (we do too) - I was wondering if they'd be too hot. Have you checked out @featherandfilly on IG? She makes a cheaper version that is just as cute! Is there someone to follow on IG that sells used ones ? You just have to get lucky and find a shop that just happens to be selling them. If you search the hash tag freshlypickedmoccs or freshlypickedmoccosins or freshlypicked you can find some that way too! Also, @featherandfilly on IG sells some that she makes that are just as cute for half the price! I have been following another momma's blog who has leather Freshly Picked Mocs on her almost 3 year old, so I was curious and searched "freshly picked moccasins review" and your post is what came up! Thank you for posting about them! 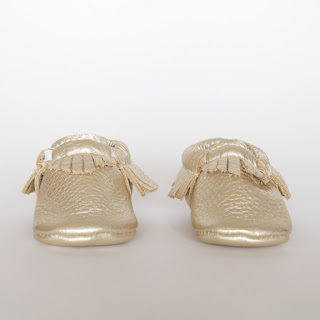 My 14 month-old son has chubby feet so we usually order from Stride Rite, but I'm looking for something more "trendy". Anyways, thanks for your review! 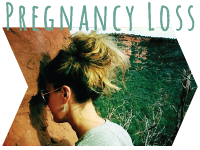 Now I have discovered yet another blog to peruse during slow periods at work! She actually doesn't make them herself out of her home. She has a team who creates them in Utah and out of California. She is also about to start having them manufactured overseas! She did when I wrote this review but now she outsources them, yep! what are the insides like? are the seams visible or is there another piece of fabric between the foot and leather bottom? Also a little confused about what you mean about the pocket on the sides when your baby takes steps... is that where the elastic connects? thank you! I love this review, I wanted some for my boys for the longest. I decided to make my own for my two baby boys. I sewn my first prototype yesterday and I am quite proud of myself. There is definitely a lot of learning to do and I have been learning so much about leather I now feel like a leather pro.Anyway, I think $60.00 is very pricey that's what led me to sketch and create some. 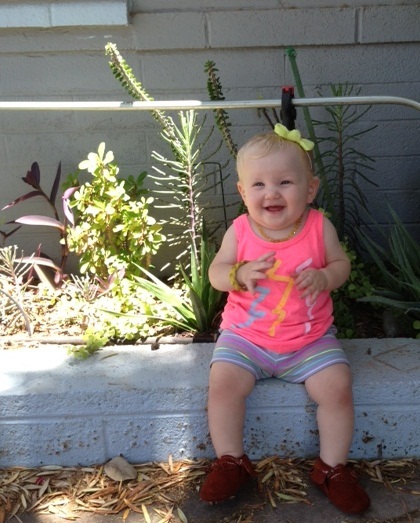 Great review and might I say your little girl is darling! Featherandfilly is nothing but a cheap copy of Freshly Picked. I mean, it's like buying a knock off version of Gucci.